After a mere 4 days into reading this book – the last day – Mike asked me why it was taking me so long to read what he thought was a kids book. This is a book about halloween, with a big jackolantern on the front, and not that many pages. So I know why he would think that. But then I handed it to him and gave him a paragraph to read. Wow, I never thought I would read anything like that about a slasher movie. Needless to say this is not a kids book at all. Short as it may be, it does a great job of telling the story of where our Halloween customs come from, if in a pretty dry style of writing. 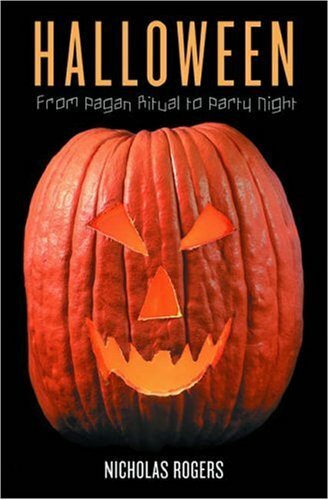 It describes how Samhain, which we actually know very little about, fused with All Souls and All Saints Day. I found it fairly surprising to learn that Halloween is a lot more about All Souls than it is about Samhain, which makes the arguments of the Christian Right against it seem pretty ridiculous. Halloween is also a lot more about transition than it is about horror. As a time marking the end of the year in the celtic calendar, and the transition between fall and winter, this was a time of divining the future and sealing relationships. “Horror” as we see it was involved only to the extent that people were honoring their dead, and pranks abounded. Disappointing? Yeah, I admit as a lover of spookiness it is. But that doesn’t make it any less enlightening. I should also note that Halloween, Christmas, and Mardi Gras share an amazing amount of similarities in how they’ve been celebrated. It’s something for you all to look into. Fundamentally though, halloween has been largely about absorbing elements of the society around it rather than being a festival with a certain set of values. In its early days in Canada its celtic roots caused it to be celebrated as a way to honor the contributions of the Scottish to Canada.Then in the 1970s it became a way to express contemporary fears through the movies, as in the quote above. And now at the turn of the century there’s the issue of its merging with the Mexican Day of the Dead along the US-Mexican border, and the attitudes of each country towards this change. In the end what this book tells us is not why we employ the imagery of ghosts and witches and black cats so much as that this is a festival rooted in change, and as the years go by it will continue to evolve.